President Donald Trump is rewarding the National Rifle Association for its support of his campaign last year by speaking at the organization’s annual meeting taking place in Atlanta this week. 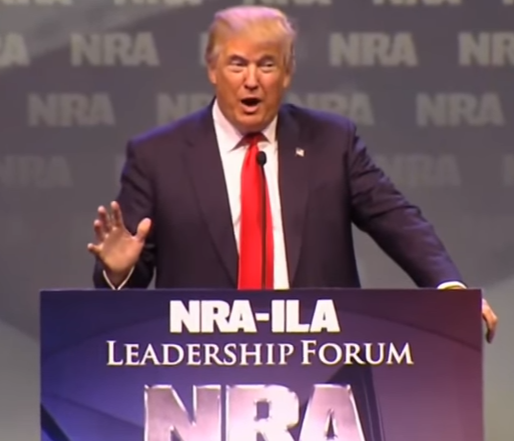 Trump’s speech is scheduled for Friday afternoon during the NRA-ILA’s Leadership Forum. At last year’s NRA meeting, then-candidate Trump received the group’s endorsement and pledged to “save our Second Amendment” and appoint judges who would back gun rights—which played extremely well with the audience. Now, as President, he will likely reiterate those pledges and cite recently appointed U.S. Supreme Court Justice Neil Gorsuch as the type of judge that NRA members can expect to see at all levels of the federal judiciary during his presidency. While NRA members are enjoying the workshops and the 15 acres of guns and gear in the exhibit hall on Saturday, Rep. John Lewis (D-GA), whose district encompasses Atlanta, will be teaming up with former New York City Mayor Michael Bloomberg’s anti-gun group, Everytown for Gun Safety, to oppose what it calls the NRA’s “guns everywhere agenda.” They will be protesting outside the convention, proving once again how clueless the anti-gun lobby really is.